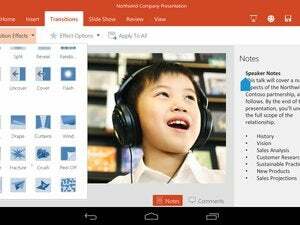 Microsoft is planning to overhaul its Office apps for Android eventually, but in the meantime users will have to settle for a smaller update. The latest version adds the same Dropbox integration that arrived on iOS a couple weeks ago, allowing users to save, load, and share documents stored in Dropbox directly through the Office app. Users can also open a document through Dropbox, edit it in Office, and have it automatically save back to Dropbox. The update also adds the ability to generate OneDrive share links through the Office mobile app. To do so, tap the context menu (usually in the upper-right-hand corner), hit the Share button and select “E-mail as link.” Anyone with the link will then be able to view the document through OneDrive, or edit it if the user allows. For Android users, a much bigger update is coming that will split Office into separate apps for Word, Excel and PowerPoint, though Microsoft hasn't announced a time frame. The overhaul will include a new layout and many more tools and formatting options than the current version. Microsoft is also working on Office for Android tablets, with a preview available by filling out an online application. 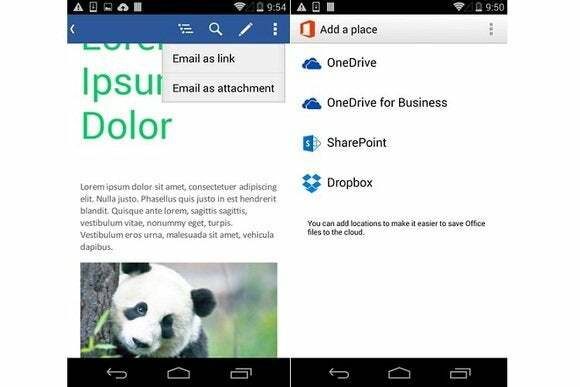 As with the recent iOS app overhaul, the upcoming Android apps will include free document editing, though some advanced features are hidden behind the Office 365 paywall. Why this matters: While Microsoft has shown plenty of appreciation for Android with unique apps and features for phones and wearables, it's a bit slower on the uptake when it comes to Office. The addition of Dropbox support and share links suggests that the full Android overhaul isn't imminent, but at least users aren't being completely stranded on new features in the meantime.